Google Glass: What's it like to drive wearing Glass? What Is It Like to Drive With Google Glass? An attendee tries Google Glass during the Google I/O developer conference on May 17, 2013, in San Francisco. So I’ll try to eliminate some of the things people aren’t aware of who have heard of Google Glass but know nothing about it: First, it’s not in your line of sight; it’s slightly above it. Second, it’s not always on. Third, what you’re focusing on is not 2 inches away from your face. It’s at a distance of a few feet. With this said, I’ve had my share of experiences driving with it and don’t think it’s very distracting at all. Something that I can compare it to is switching your focus from the road to your rear-view mirror. That’s probably the closest comparison I can think of to “unfocusing” off of the road. It might even be safer because to see your rear-view mirror, you typically have to turn your head a bit. When you’re driving with Glass, it’s above your line of sight and to the right a little bit. You’re still facing the road and can still see what’s going on beyond what you’re focusing on at Glass. It’s as dangerous as anything you could likely mess with in the car, whether it be the radio or looking in a rear-view mirror. On the scale of things, though, I would say it’s less dangerous than most things. Safer than using a GPS on a car mount and glancing at that. No, it’s not distracting; it’s not on all the time. Once you’re used to wearing Glass for a while, you can honestly forget it’s on your head sometimes. Obviously for someone who puts it on for the first time and has his or her bold opinion on the fact that it’s immediately distracting is a bit irrelevant to someone who has been wearing it for more than a few weeks. They’ve implemented the naviagation—the best-scenario usage besides the Bluetooth headset case—extremely well. When navigation is on—though it’s not on all the time—you can see a map of your car and the road in front of you. It’s an extremely Holo-esque design (black and blue colors) and has the same arrow as in the Android navigation app. The app will ding through the speaker behind your right ear that you have a turn coming up and will notify you when you get up to 0.5 miles away from that turn (not official lengths that are programmed, but it’s what I’ve noticed). It’s extremely simplistic and notifies you in a very easy manner without distracting you. However, you can activate your device and reference what the next turn is or what the map looks like. It’s not like you can only know when it tells you. In terms of driving, yes. Especially when you need to make a phone call. If your Glass device is correctly connected to your Android phone, all you need to do is either tap the side of the device or tilt your head up slightly if you have the angle feature turned on. Simplistic, easy to use, not very distracting. Much easier on someone who has been using it for at least a little while. Is Google Glass “a Segway for your face”? How useful will Google Glass be? 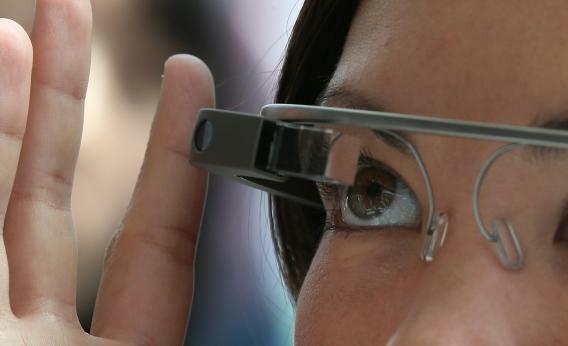 Will Google Glass work well for reading e-books?